At-home testing kits for Syphilis from $79. Affordable, 100% Confidential, 5 Minute Testing. Order now! The second reason syphilis is hard to study is because the bacteria causes the disease is so delicate. Most disease causing bacteria are pretty tough–you can wash them, dry them, and then look at their exteriors in great detail under a microscope. T. pallidum doesn’t survive that rough treatment. It tends to break open and spill its guts, making a mess, and also making it impossible to figure out which proteins are supposed to be on the outside of the bacteria. And those proteins on the outside of the bacteria are key–they are how our immune system recognizes bacterial invaders. They are how vaccines work, too. The search to find and identify these proteins in syphilis has taken a long, long time. T. pallidum was first identified in 1905, but until now, no one has been able to figure out which proteins it sports on its outer membrane. Researchers have tried all kinds of tricks. When genetic analysis became available, they started looking at T. pallidum’s genetic code, in hopes that the genes for its exterior proteins would look like the genes other bacteria have. 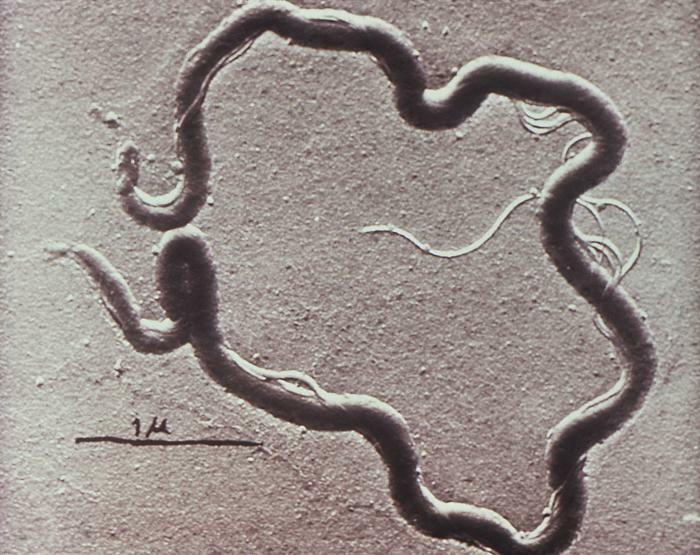 But T. pallidum is part of the spirochete phylum of bacteria–they’re spiral shaped and weird, about as closely related to other bacteria as we are to invertebrates. When UConn Health microbiologists Justin Radolf and Melissa Caimano began analyzing the genetics of the syphilis bacteria they collected from patients in Colombia, as well as the syphilis samples sent to them by collaborators in San Francisco and the Czech Republic, they began to notice that the strains from different places were very similar. Not many genes differed. And that makes sense–in an organism with such a small genetic code, every gene must be essential. The genes would only mutate into a different form if it was a matter of life and death. And what controls life and death for T. pallidum? The researchers then actually made the proteins and tested whether they folded into that barrel shape in real life. And then finally, they made antibodies for the proteins and showed that these antibodies did indeed attach to the exteriors of intact T. pallidum bacteria. This meant they’d found their marks–the proteins were there.